The Importance of Outsourcing IT | Landon Technologies, Inc.
With the advancement of so many technology solutions, many small-medium sized businesses are looking into establishing their own technical support department or hiring their own IT team to manage the tasks. The IT department has become one the most important departments in any given company and having an in-house IT staff certainly has its benefits. However, many small companies are finding out that it is unpredictably costly and oftentimes too bothersome for them to carry out all technical support tasks and have started to outsource their IT requirements to other external companies. This article will highlight three most obvious reasons why outsourcing IT is important. In a typical outsourcing arrangement, the IT contractor takes full ownership and responsibility in managing technology related duties thus eliminating pricey investments in computing equipment, office space, and hiring, training and other expenses. Outsourcing can also make costs more predictable since most IT service providers can be contracted on a monthly or even per project basis. The true cost of employing an IT engineer is more than just the annual salary if you factor in holiday pay, insurance and other government imposed benefits. Many Fortune 500 companies like Johnson & Johnson outsource their IT division and are saving millions of dollars each year. Handing over workloads to IT vendors provides access to infrastructure and technical expertise that are otherwise available only to larger companies thereby leveling the playing field. Reliable IT operators have years of experience, skilled personnel and modern, up-to-date systems to implement the tasks and can help smaller businesses stay competitive. Training and carrying out technical support activities consumes valuable time. Contracting service companies with managed IT services and experienced staff is a much better deal. The time gained through delegating IT workload to an external workforce allows businesses to concentrate on their own core competencies and help them react quickly to market changes. Response time to support calls or service level agreements can also be pre-arranged. For example, most technical support providers offer remote support services. With just a phone call, you can have a technician remotely looking into the system within minutes. Outsourcing or placing technical support in the care of a trusted service provider is a smart and practical solution. And many business operators who are in the habit of doing everything on their own are now realizing its importance. 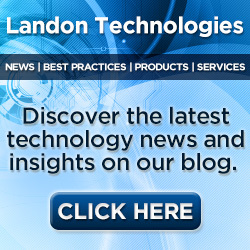 The Pros at Landon Technologies, Inc. are experts when it comes to Outsourcing IT. Get your free quote today!